Yes I am a particular fan of w3schools, mainly because they have got a code testing playground, invaluable for immediate testing and experimentation. Now that you are ready, lets get started. A gadget is simply a webpage with its scripts, stylesheets and everything, only that it is zipped into an archive such that the .zip extension is smartly changed to .gadget. So if you already design webpages, all you need to know is how to create a manifest file and zip everything into a .gadget file. A manifest is nothing scary, just a file that contains data about the data or metadata. It will contain information like who you are, who programmed it, the name of the gadget, the HTML file to be used, the version number and all the information you want to share, all in neat tags. I'll come to that later. Yes, this whole thing is compressed into a zip archive and the extension is changed to .gadget. I intend to keep this very very simple. So lets create a simple HTML. But wait, I don't like those Hello World programs. So lets make something simple, but still pretty cool. Pretty simple. Just getting some help of the Windows Scripting Host. It just fires chrome.exe, provided it is installed, otherwise a nasty alert will popup on the screen. In this very basic example, I don't feel like using an external CSS file. But for more serious projects, it is almost a rule to keep CSS files in their own directories and sourcing them from the HTML code. But here our CSS code is too basic to warrant any extra attention. Just setting the size of the gadget and nothing else. Now it is safe to go back to the HTML. <img height="128" src="images/background.png" onclick="return runChrome()" name="sub_but"
The rest is simple and self explanatory, call the mouse action events and pass the parameters to the function. Ofcourse, make sure you have the images as seen in those pngs. 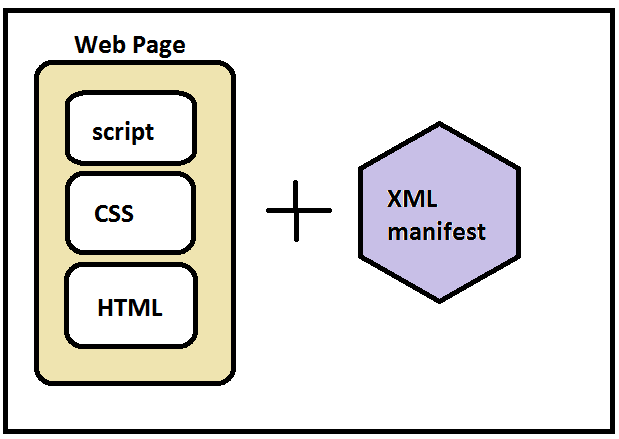 Now just create the XML file such that the name of the HTML is mentioned exactly in the XML like this. Now just zip everything. A <filename>.zip is created. Now rename it to <filename>.gadget. The icon will immediately change and you will have your gadget ready. For example download this gadget and see the interiors by just extracting it. Hope you enjoyed reading this article. Please share if it helped you. Happy Coding!